Before purchasing your walk-in, you may be wondering how much it will cost to operate your walk-in. To give you a rough estimate of how much it cost to operate a walk-in cooler or freezer, using the national average of $0.1071 per kilowatt, look at the chart below. Note: The above figures are estimates in a controlled environment; your exact numbers will vary. *These numbers were figured using the 12-month rolling average of $0.1071 kilowatt hour cost. According to the Energy Information Administration this is the average cost in the United States for commercial electricity as of November 2014. This chart was created using several assumptions that can affect your actual operating cost. Inside and outside temperature of walk-in. The temperature and the weight of the product entering the walk-in. This is just to name a few. If you would like to be more accurate using your electric rate, follow the instructions below. Most walk-in refrigeration systems are designed to run 80% of the time or between 16 and 18 hours per day. For a quick estimate of the cost to run your walk-in use the chart and formula below. For standard sized walk-ins, we have estimated the average kilowatt hours used to run the selected sized walk-ins. To figure out your monthly cost, select the walk-in you want to calculate and multiply the associated AKWH (Average kilowatt hours) by your cost per kilowatt. Note: The above figures are estimates; your exact numbers may vary. For example, an 8×10 cooler would be figured by multiplying 1,113.86 by your monthly kilowatt cost per hour. In this example we used a cost of 11.89 cents per KWH. If you would like to calculate an estimate on a different sized walk-in, follow the provided formula below. You will need to get a BTU (British Thermal Unit) requirement for the walk-in you would like to calculate. You can get this information from calling your dealer, U.S. Cooler Company at 800-521-2665 or go to U.S. Cooler’s refrigeration sizing program to size your walk-in. If you have your dealer or U.S. Cooler on the phone you will also need to get the voltage and amperage of the refrigeration system that will match your BTU requirement. When you have the amperage and volts of your refrigeration unit, follow the equation below for your average monthly electricity cost. Make sure you have the amperage and volts for both the condensing unit and evaporator coil. This takes the amperage (A) times the voltage (V) of the condensing unit plus the amperage (A) times the voltage (V) of the evaporator coil to get the total watts (TW) of the refrigeration system. The amount of watts used is then multiplied by the number of hours the system will run per day. For coolers the average is 16 hours and freezers average 18 hours per day. This will give you the daily amount of kilowatts required daily. Multiply the daily required kilowatts by 30.42 which is the average days per month to get the monthly required kilowatts. Multiply that number by the Kilowatt cost of electricity in your area to get your cost per month. This will give you an estimate of what the walk-in will cost to run per day in your area. As discussed above these formulas will give you an idea of the cost to run your walk-in and are not to be considered exact figures. If you would like more accurate figures you need to contact a licensed mechanical engineer to design and calculate your system. please send best offer for your walk in cooler & freezers size 10′ x 24′ x 9’6″H new and send list prices of all your products as we interested to be your agent in Yemen. please send proforma C+F Hodeidah sea port Yemen thanks. The energy numers you have posted have to be without product in a constant environment and without door openings? The numbers you are showing are similar to the controled study we did up to MMCC and much lower than what we have found when doing energy testing at actual resturants. Please let me know if my assumptions are correct, because it would be helpful for class. These are rough estimations and aren’t taking into account the eight variables listed in the article like door openings (since these will vary greatly in specific situations). Did you have numbers you could share for specific cases? Hello Mike, could you link to the study you mentioned in which you evaluated the actual use by surveying restaurants. Why is the average kWh for the 8×8 cooler higher than for the 8×10 and 8×12 coolers? It has to do with the refrigeration system used in the tests. The 8X8 utilized a 3/4 hp unit while the 8X10 used a 1 hp unit which performed more efficiently in this instance (the 6X6 and 6X8 boxes used a 1/2 hp unit). These were calculated in controlled settings, so they’re to be taken as rough estimations. In real-world conditions the 8X8 may in-fact cost less to run. Do you know of any studies that tested the energy consumption of walk-ins at different temperatures? For instance, a 10×10 freezer at -10 degrees vs. -5. 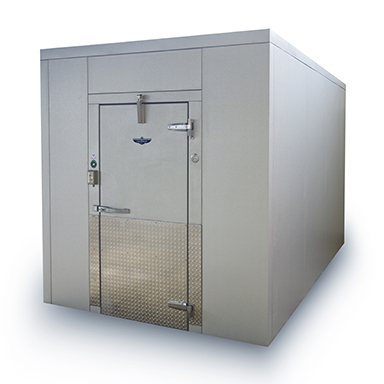 Hello – I am trying to calculate the power usage of our custom walk-in freezer (20 x 8 x 8). It is 230 volts and 60 hertz and the door is only opened twice a month for an hour or so. Would anybody be able to help me figure it out? We use our 6×10 walk-in cooler only Friday afternoons through Sunday mornings – almost every weekend. Does it cause problems to turn it off and then turn it on weekly, or should we leave it running 24/7? It’s empty from Sunday noon to Friday afternoon. In general, refrigeration equipment should just be kept running. It’s possible to shut it down for the days you are not using it and reduce some energy costs. However, the refrigeration system will be put under undue strain every week to pull it down to the correct temperature. This is going to increase your risk of something going wrong causing costly repairs or replacement of the unit. Is it better to shut down or leave running a walk in freezer or cooler refrigeration system during school summer break? Refrigeration systems are designed to keep running and cycling indefinitely. But if energy costs are a concern, you could shut it down. Just be aware that there may be issues starting it back up if your system isn’t mechanically sound or has any leaking valves. Why is the average cost per month the same for 6×6, 6×8 and 8×8 freezers? PS: useful and interesting article. These tests were done in a controlled environment (without opening of doors etc.) and the walk-ins tested statistically similar. The costs should be regarded as rough estimates. I was planning to buy a cooler for my room as summer is on its way. So, suggest me a best cooler for me. I am the only person and had 2 rooms. Great peace of information, it is really helpful for people who want to purchase coolers and getting confused in choosing their best fit. Our kitchen only operates three days per quarter. Is it better to buy large commercial reach-in refrigerators or walk-in cooler?